Oia, Santorini is often considered one of the most beautiful villages in Santorini. Between the Santorini caldera, the traditional blue-domed churches, and absolutely breathtaking sunsets, it’s hard not to stand in awe of the beauty around you when you stay here. It’s what brings so many honeymooners, families, and just individuals who want to travel from all corners of the world to Oia in Santorini, Greece. So it’s unsurprising that there are so many different types of accommodations in Santorini. From hotels to your own apartments overlooking the caldera and the Aegean, where you stay in Santorini can make all the difference when it comes to your experience. More than just Oia, Santorini, Greece is full of 20 villages, each with their own charm and flavor. In Megalochori, you can find Santorini’s rich wine country. In Fira, you can find an avid nightlife. In Perissa, some of the most popular beaches on the island. In your Santorini holiday, you’ll want to see all of these sights. So what makes Oia stand out as your accommodation destination? It’s more than just the beauty of Oia, though the stunning sights make a case for themselves easily. For many visitors, the close proximity to the caldera alone makes it a desirable location. It’s also a convenient location. Oia is one of the more heavily populated villages in Santorini, so there’s plenty for visitors to explore in the village itself. Consider for instance the old port of Ammoudi Bay. Walk down the 300 steps to the port and the fishing village below. Hike to Castle Oia and watch the sun set over the cliffs, possibly the most beautiful sunset in the world. You can even go sailing or take a boat tour. When you’re ready to move beyond it to villages like Akrotiri or Finikia, you can easily take the bus or rent a car. With an easy distance to shops and restaurants, as well as the bus, you can experience it all from Oia, Santorini. Staying in Santorini apartments in Oia, Santorini offers a different experience from staying in Santorini hotels. If you’re looking for an organic experience, one that feels more like living in Santorini than simply passing through, you want to stay at Santorini apartments rather than hotels. 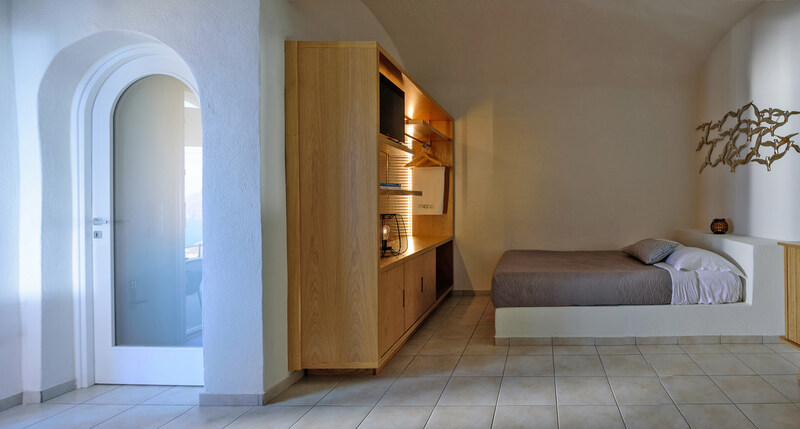 In apartments in Santorini, you’ll have a refrigerator that you can fill yourself, with no extra cost from the accommodations. Santorini apartments are larger than hotel rooms and have separate rooms so you always have room for living, not just crashing at the end of the day. Many Santorini apartments also come with your own veranda or balcony so you can overlook the splendid views of Oia, Santorini. Strogili Traditional Houses provides apartments in Santorini. If you want authentic Santorini charm, Strogili can provide just those apartments. 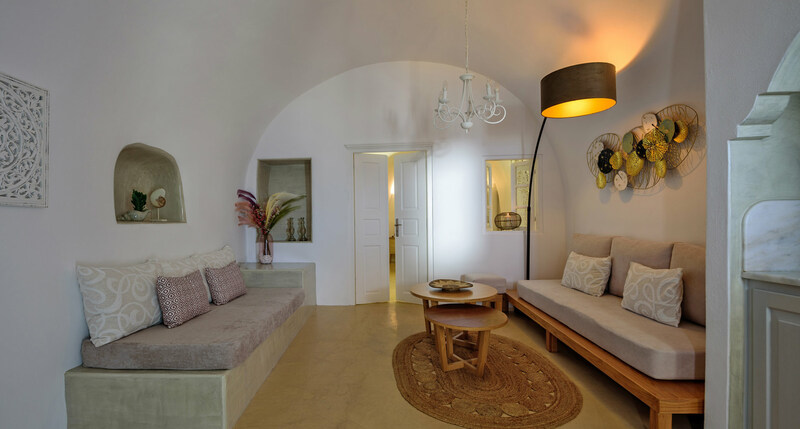 Santorini is known for that traditional Cycladic architecture, with whitewashed stucco and light, airy rooms. Every room in Strogili Traditional Houses is built in that same beautiful style. Here you can be immersed in the classic white arches, smooth surfaces, and sunlight filtering all throughout the apartments. Santorini has charm to be enjoyed, and it can be found here at Strogili in Oia, Santorini. Strogili also has a number of amenities that are hard to beat in Santorini. All the necessities and then some are provided: a mini fridge, air conditioning, private bathtub, phone, and safe deposit box. These Santorini apartments also come with wifi internet access, a hair dryer, an iron for your clothes, and your own veranda. Facilities are also very accommodating for apartments in Santorini, including a large swimming pool during summer months, shuttle service to and from the airport, room service, and car, motorbike, and boat rental. A holiday isn’t just about a list of things to see and do and then leave. It’s an experience and should be experienced fully. In a village like Oia, and accommodation like authentic, traditional Santorini apartments with Strogili Traditional Houses, you can have a Santorini holiday you won’t forget.